Cloud computing is only growing and innovating and at Intel, it's one of their top 3 IT objectives for 2012. The idea of a virtualized data center is changing the way Intel looks at its architecture: from the client technology employees use for business services to the data center infrastructure to support those services. When it comes to the future of the cloud, just like your organization, Intel is focused on a strategy to provide cost-effective, highly agile back-end services that will boost both employee and business productivity. 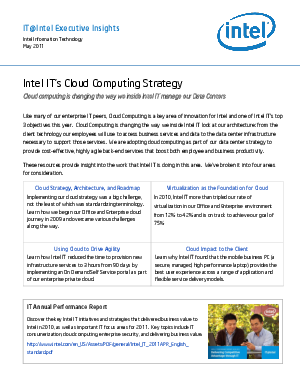 Download, Intel IT's Cloud Computing Strategy, for insight into the work Intel IT is doing when it comes to their work in the cloud. Don't miss this definitive reading for a better understanding of how cloud computing is changing the way Intel and its IT managers handle their own data centers.